While some bird species migrate south in the winter, there are many species that stay year-round in the Pacific Northwest. These include Juncos, Jays, Sparrows and Tawhees. As leaves and temperatures fall, it becomes more difficult for these birds to find food and shelter. Creating a bird-friendly garden not only helps our feathered friends, but can benefit your backyard micro-ecosystem. Having birds around will benefit you and your backyard in several ways. For starters, birds eat insects such as aphids, mosquitoes and snails. They act as a natural pest control that can save your garden from harmful insecticides. Smaller birds,such as sparrows and finches, eat weed seeds, reducing the need to use chemicals in your garden and the pain of pulling weeds. Further, hummingbirds are great pollinators that can enhance the size and color of your blooms by spreading nectar from plant to plant. There are also intellectual, psychological and economic benefits of being bird-friendly gardener. Creating a bird-friendly yard with native plants requires more time outdoors - and what is more relaxing than fresh air, fragrant flowers and the satisfaction of a well-kept garden? As you spend more time watching your birds, you will begin to notice migration patterns, plumage changes and courtship behaviors. You’ll also begin recognizing familiar faces and relishing the arrival of new ones. As for mental health, a study by Daniel Cox at University of Exeter found a positive relationship between good mental health, plentiful birds and vegetation in neighborhoods. This relationship included reduced likelihood of depression, anxiety and stress. A well-maintained, bird-friendly yard also benefits the resale value of your home. 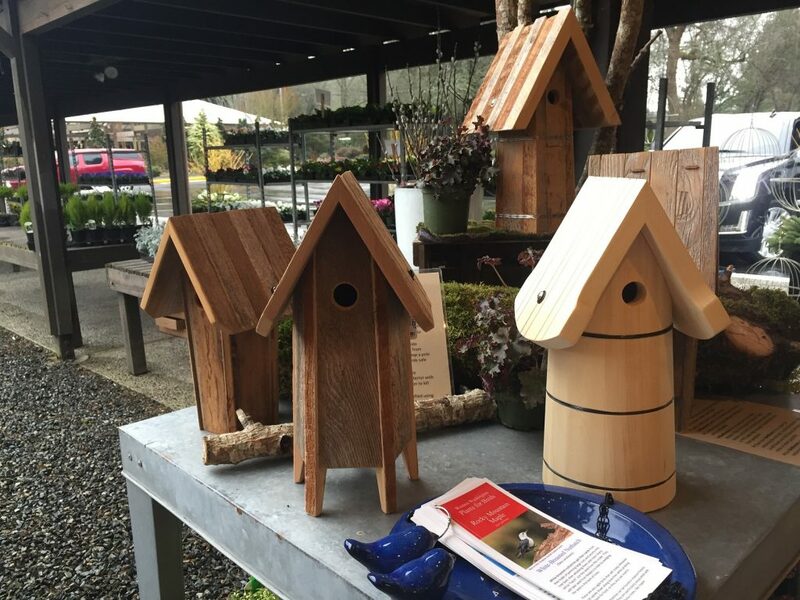 Our birdhouses our vented, feature removable roofs and have little peg-ladders to help chicks climb up to fly the nest! Provide food, water and shelter. Place birdhouses at least 20 feet from feeders and baths. Keep them high enough to keep them safe from predators. Clean your birdhouse once per year by removing the old nest, scrubbing the interior with a stiff brush and a mild bleach solution. This will kill mites and other parasites. 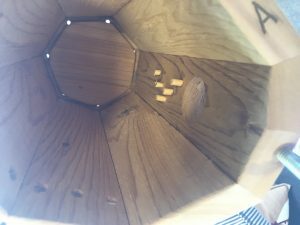 The roofs on our birdhouses are removable. Landscape with native, environmentally conscious plants that require less water and are more disease resistant. Use diverse, layered vegetation (plants and trees that grow to different heights) to provide shelter for a variety of bird species. Birds love red berries and will choose those above others. Examples of native shrubs with red berries are Aronia, Barberry, Cotoneaster lacteus and the hips of Nootka Rose. Other berry-producing shrubs include Symphoricarpos (Snowberry), Mahonia (Oregon Grape), Pyracanthus and Vaccinium. Some decorative wooden birdhouses might look splendid in the garden since you mentioned that birds act as natural pest control and we need birds to keep the roses alive. Since you mentioned that birds require us to spend more time outdoors, I might find that it could help me get into a better mood if I see some of them in pretty birdhouses and frolicking about the roses. I’ll be sure to clean the birdhouse once per year as you suggested so I’ll buy one that’s easy to clean to make things hygienic for the birds to stay in as well.